BLOCKED?The Great Western Greenway at Tonragee, Achill has been fenced off by a local individual in dispute with Mayo County Council. 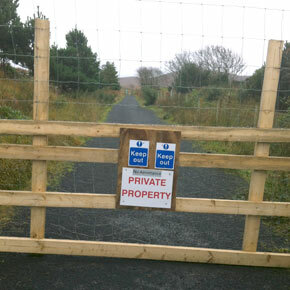 A one-mile section of the Great Western Greenway in Achill has been closed off due to a dispute between a local individual and Mayo County Council. The Greenway was closed off in the last two weeks, and cyclists must now cycle along the main R319 for close to two miles at Owenduff and Tonragee East, between Mulranny and Achill Sound. The closed section includes the part of the Greenway that leads onto the point where cyclists en route to Achill must depart the off-road Greenway and join a dangerous stretch of the R319 for approximately one kilometre before returning off-road closer to Achill island. There have been many calls for Mayo County Council to construct a Greenway alongside the main road at this section of the R319. Work on that is now underway, but, ironically, the council has run into another problem right next door. A spokesperson for Mayo County Council confirmed it was aware of the closure and said it was attempting to resolve the issue by agreement with the individual involved. He added that failure to do so would force the council to ‘look at alternatives’. He would not shed any light on the nature of the dispute. A formidable fence has been installed on the Greenway (see picture), effectively blocking cyclists and walkers from continuing along the route. The council has erected signs saying the Greenway is closed due to construction, which led many people to believe there was no dispute involved. Another part of the Greenway at Tonragee was closed by landowners in May 2012 over issues relating to lack of adequate fencing along the Greenway. The spokesperson for Mayo County Council said they believed this current closure is not connected to the previous closure. The Great Western Greenway from Westport to Achill was built with the consent of landowners along the route, who gave up their land for the amenity, which has proven a huge success from a tourism point of view. While it is off-season at the minute, cyclists are still using the Greenway on a daily basis.